Surfing Nias and Banyaks: From the Inside, Looking Out! Any trip with a handful of waves like this one is a good trip! TPW’s CEO Jamie Gray and number one sales experience specialist Charlie Pierce report on their stealth mission: Surfing Nias and the Banyaks. I just returned from an amazing trip to Nias and the Banyak Islands in North Sumatra, and as much as I thought I would be getting used to the switch from boat life back to office and sales reality, it actually seems to be getting harder and harder each time. Still though, I shouldn’t complain, I learnt a lot about some of our key Indo destinations, sampling the travel routes as well as my share of green room views, literally from the inside looking out. 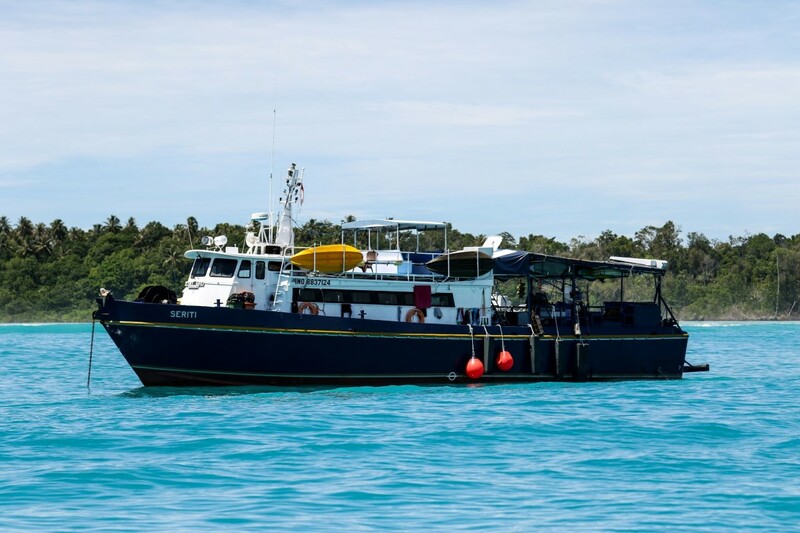 On this particular “Educational” as they are called within the industry, I teamed up with The Perfect Wave’s CEO Jamie Gray, and we jumped aboard the amazing Seriti to sample some “Fresh Frontier” offerings in the Banyak islands. If you’re not sure about tacking Nias on to your trip just have another quick look at this pick of an uncoordinated chump at small to medium Lagundri! On our way we decided to swing by Lagundri for a couple of days to get our eye in, and of course also check out the state of play in and around Nias. In all honesty these type of staff trips are absolutely key to being informed and credible in supplying information to our much valued clientele. Yes we have fun, but it is so important that we have this firsthand experience, so we are qualified to inform you as to what to expect on each and every experience. To his credit Jamie makes sure all of our sales experience specialists are well travelled, and refresh their travel knowledge every season at all key Indian Ocean destinations especially. I was a bit nervous heading up to the Banyaks with no major swell events lurking, but one thing I did learn was that the area picks up more swell than I was expecting! So even though we only experienced 3 small to medium pulses, we ended up scoring heaps of waves in the fun to good range. 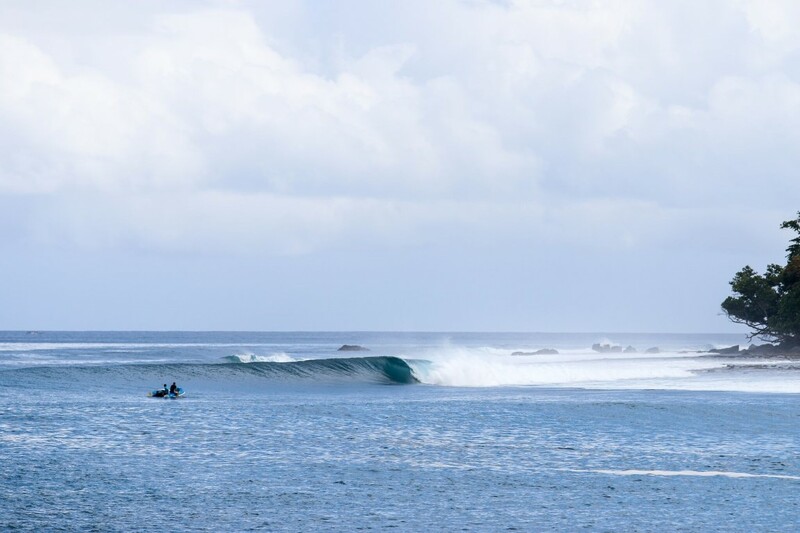 The big Banyaks draw card is definitely Treasure Island, so to arrive and be greeted with 4 – 5ft perfection peeling down the point on the first morning is the best way to start any trip. Add 3 barrels on the first wave of the day, and after that it doesn’t matter too much what else happens. We ended up scoring days of 4ft fun, with a few trips around to Cobras and Turtles and further out to Babi Island on the smallest day where the reef set up does its best impersonation of a perfect beach break. Unfortunately, we didn’t really see the best of Lokok Point but I can envisage adding that left to the perfection of Treasures would make for a pretty insane trip. The Seriti itself is an awesome boat, it’s huge, easily one of the best set up boats I’ve been on. From the big bunks with curtains for extra privacy, to the small details like personal drawers on the back deck so you’re not constantly searching for sunscreen and wax, everything was made super easy. Even to the point where with our larger than normal group of 12 surfers the boat never felt too busy or crowded. Add a legendary captain like Suzuki and it is definitely a set up I can absolutely recommend to anyone. Then of course we got the added bonus of a couple of days in Nias to start off and to be honest I’m not sure why that’s not standard procedure for anyone heading to that part of the world. The crowds in Nias are always going to be a bit more intense than further North in the Banyaks, but it still wasn’t as bad as I was expecting and when you surf Lagundri it’s doesn’t take long to work out why it’s one of the most famous waves in the world. We only had a day and a half of surfing and saw it at 3ft and onshore (but still ridiculously fun) and then enjoyed 5ft perfection, which was enough to make me wish we had a month there. A big thank you to Suzuki and Tim for helping make this trip happen. Nothing better than a pickup service for when your arms have turned to jelly!